im watching the 1055 pst timeline. DJT put in a bearish engulfing candle six sessions ago! Maket hanging tough. Do I remember correctly, that you said in the EW book(Frost & Prechter) that the portion on “Leading diagonals” is incorrect because they do not exist? There is no known example in captivity. by by , is this wave 3 down ? yet this is now the moment of truth . Concerning your from last week…What if you used a “close only” line chart? Your bottom trend line would be drawn using the November 2016 low and the August 2017 low! Then draw a parallel upper trend line with the beginning point being the July 2016 closing high! Does that change things enough to still be operating in the channel you visualize? Another overnight with no impulsive futures decline and I will be revising my wave count. If that happens we are going higher imho, as the only way to interpret the price action would be an ongoing remarkable wave extension. Scaling out of a portion of some of my long term holdings this week for risk management. Some of my positions have increased so much that they are not weighted properly now. Still very long and continue to adjust stops based on my system. No predictions on the future – just following my price based system. 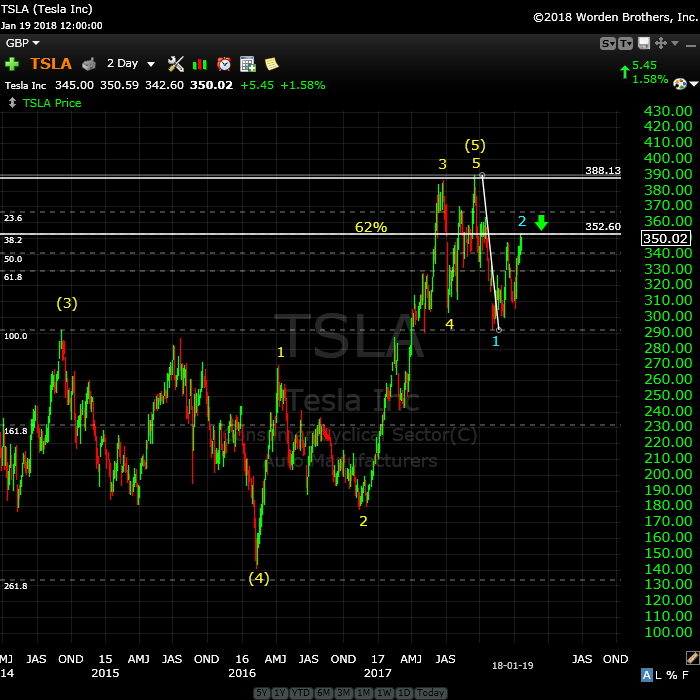 One trade I am thinking about taking soon is shorting TSLA although it is not a short yet based on my system. It is just a fraudulent company that is way overpriced. I agree. Along with NFLX and GE, they are all eventually going to zero, for that is exactly what they are worth. 24 hour futures are now in wave 9 .
a failure to make a new low argues a completed corrective move. A B C X A B C D and now in wave E.
I have no timelines to go by . this is what i have been watching all day . YM 5 minute 24 hour chart . yet there is now 9 waves . yet if it breaks below 26172 then lower prices . there is no more swings left to be had . before a turn higher if that is what is going on . breaking 26172 is not a good sign in my opinion . a sell off from here into the close would not surprise me at all. I just got done re-listening to James Flanagan’s video and his take is that there is no chance of a crash in this market as its “DNA” resembles only one other period in market history and that was back in the 1950s which saw a similar period of a sustained un-interrupted advance. It is truly stunning that the only thing he seems to take into consideration in issuing this prediction is the similarity of the duration, and size of the price advance. He is confident that that cycle history will vindicate his call, and that at the worst we will see only a mild correction with much more to go in the bull run. I do think he is correct in calling an upcoming end to the decades old bond bull market with interest rates going higher. Fascinating! ill let the market decide on how it closes . decent day overall for me . The long term MACD on the SPX is in the stratosphere on all time frames – daily, weekly, monthly. This is a parabolic market that has rarely been seen. Will it end? Of course it will. But no one knows when and how. Shorting into this has been a losing trade for a long time and all top predictions have been dead wrong for a long time. If you haven’t been long, best to trade other markets and wait. The huge problem with trying to short a market like this is it could have a quick 10% correction and still not violate the long term uptrend which could trap bears even again. Have to look at big picture and price and quit relying on “predictive” tools. To break this trend, the market would have to trade several hundred points lower. Anything is possible from here on out. We are in unchartered waters. Wow! Jody every trader has been there my friend. I lost a lot of money thinking that Bob Prechter and EWI were infallible. That is a lesson you should only have to learn once. Making trades based on anything other than one’s own personal, very careful due diligence is a recipe for disaster. The most basic rule for staying in the trading game is limiting your risk. It is truly stunning how few traders pay attention to this. One of the best pieces of advice I was ever given about trading is that the focus should never be on how much you can profit in a trade, but how much you could loose! Lastly, I have made it a rule to be able to walk away from every trade I make with a 100% loss and still live to fight another day. This should always be the case if you are exposing no more than 3% of you account with each trade. Please don’t despair. Where there is life there is hope…always! In the user area of the site (when you click on edit my profile, there’s a place there to select the public display name. You had your whole name selected. I just changed it to Emily. I can delete these if you like and you can re-enter. Let me know. I changed the ‘e’ to a capital. am looking @ the VIX’en FAMILIA also — but $VVIX is MY NUMERO UNO — see IF it dips to the low 70’s or hits its March 2017 – 52wk Low of 71.75 … then you damn well go short the markets. also looked @ $BPSPX closed UP .80 @ 82.60 … also noted earlier today that on May **22**, 2013 — THE high was @ 90.20 .. which you never know IF this market has more legs — MIGHT see the 90s. I don’t know why your comments are going to moderation, though. (sigh … the technology). I have yet another company looking at the “bug” so maybe it’s part and parcel of the same thing. Hmmm. Now you’re not going to moderation, all of a sudden. The deleting part will lead to negotiation, and I don’t have the Donald’s book, so I should be ok.
I’m not the big on strings of superlatives. the only thing/s that stood out for me today — were the 3 amigos $FVX $TNX $TYX and waited eod for $SKEW/X (Canadian version w/ an “x’) & of course $VVIX. read some where they think 10-20% downdraft coming. I only see about 3% and that’s either Valentine’s Day area &/GANN New Year Day – March 21, 2018 area. want to put as much info on one post instead of different posts. on another note :: am waiting for Twitter to reinstate my last 2 twitter accounts so I can lock 3 of them — but they sneaky — have like 20/18 PHANTOM followers on the buddiee18 one. ticks me off to no end. lol so am insulting them. am NOT into political correctness bs. don’t know — but methinks all hell will break loose & heads will roll @ the FBI DOJ . been following Judicial Watch & The Pundit …so am thinking Valentine’s Day (Massacre) or Ides of March — March 21, 2018 (GANN) we might have that 3% dip in the marketplace ? seems the elites TIME their events w/numerology & moon phases — not kidding you . 1. a select part of a group that is superior to the rest in terms of ability or qualities. I have to figure out why your comments are going to moderation, luri, but I likely won’t get time to work on that during the day today. UUP at 23.36 in pre market. We’ve exceeded the target, which is fine. I’m expecting a turn. DXY update……. wake up people’s……we haveth …..”work”……….to do! the sun riseth, and the wind bloweth…………..”BE WARNED”!!! Yeah, that helps. Like it when it hits the news. thought I’d pass this site out b4 the regular markets open. got this from my OSS newsletter. it’s quite interesting re watching the “news” people…and following their lead. 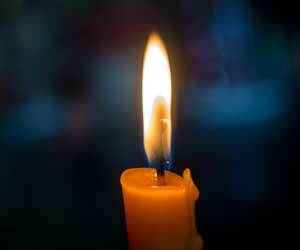 just turn off the tv & just watch the price action & know your fibonacci levels. month of February prediction is quite interesting (for me). gather no Valentine’s “massacre” lol. anyhow — enjoy & GL trading today. Another change of mind from Dr. Fraud. It is nothing short of stunning to see what is going on in the world of prognosticators. I watched a video by James Flanagan last night who is now convinced that the current bull market most closely resembles the one from 1956 to 1959 and confidently asserts there is no chance of a significant market decline, and that the bull market will continue for some time yet. Several prior predictions based on the same kind of cycle reasoning and comparisons failed spectacularly last year, but I suppose we can be confident that the current comparison will hold true. Now Mehendra is telling us that the stars have suddenly gone from displaying bearish portents to being full bore bullish and that SPX 3200 is now clearly written in the stars. I have always tried to maintain an open mind when it comes to the approach others take to the markets, but it seems to me that there comes a point when one has to begin to view pronouncements of this kind with deep skepticism. If fact some of the talk I have hearing and reading in my view borders in sheer insanity. The statements people are making seem strangely divorced from any kind of reality, and I find myself wondering if we are all talking about the same market. Setting aside the current market extremes for the moment, the key consideration I think in all this is that the current market advance is based primarily on a fantastic mountain of debt that ultimately cannot be sustained, and which will never be repaid. Most of that debt will face deflationary destruction, and since most of it is dollar-denominated, this is bullish for the dollar. When dollar denominated debt is destroyed, in reduces the amount of available dollars, the dollar therefore becomes more valuable, simple. Interest rates are completing a decades old cycle and will be rising into the fore-seeable future. FED or no FED, Contrary to popular belief, the follow the market, they don’t lead it. Rising interest rates is injurious to the bond market. The bond defaults will run into the hundreds of billions as rates rise and debt service implodes. The impact on equities will be inevitable. None of these facts are secret. I can understand how the uninformed retail investor could be carried away with the frenzy of the herd. But how people who are charging others for their opinions can be recklessly purveying these inane notions for public consumption is beyond my ability to even faintly comprehend. Take care everyone! Just. That. Simple….. Up to this moment, anyway…. That is interesting. I did not occur to me that they would put their readers money at risk just to ensure a paying readership, as opposed to themselves drinking the bullish kool-aid. Despite today’s impulsive move down, the fact that they have stepped in and arrested it suggests to be we are not done yet. I still expect the turn to come via the futures market, and their failure of their attempts to halt the water-fall decline will be obvious to anyone watching. These gaps that end up being filled immediately have been exhaustion gap false flags for many months now and in my view should be discounted. There will be absolutely no question when this market finally turns. These are very nice impulsive waves we’re seeing in ES and the like. Looking good. My target for SPX was 2850.
you know those ……………………..”thick”………………coke bottle’esque’ reading glasses your granny uses???…………………. well – “PUT THEM DOWN”…………! Hmm. Suggesting a top may be in. We’ll see. Tomorrow should tell. the “UP” channel………………………must fail…………………….first, and overlap second! the uptrend still in tact. know am in a lonely camp here. lol … but yea.. expected today some temporary downdraft…based on SKEW/X & the 3 AMIGOS FVX TNX TYX — but you notice that TODAY they green ? also notice $BPSPX — not a dint (yet). also if you into numerology — noticed yesterday — the mirror image of “42.24” in SPX NEW 52wk HIGH of 2842.24 ?? 😉 and today the low was 2824.81 (so far). I use DeMark calculators :: https://www.tradeviewforex.com/demarks-pivots.php & also follow SPLV which many a times seems to “lead” SPX. yea.. know… many think I’m crazy to think that…but its been able to keep me out of trouble. today’s range (so far) 48.39 – 48.65 (NEW 52wk high) buttt ..
for NDX — I use NDX : VXN indicator for daily — might see 347.02 — Dec low — but don’t think so — not yet. oh yea.. and the $VIX : $VXV is NOT > 0.91 — so not panicking and doubt we going lower this week. anyhow — there’s more – but I won’t bore you. luri — that was funny re “elites” — call them deletes, eh! I also daily check $XLY & $IAI — kinda telling which direction we headed ? I hate to keep posting — butttt — NOTICE ?? how from the VIX’en FAMILIA — the ONLY 2 REAL high — are $VVIX & $VSTN (near term volatility) — while rest are anemic. & $BANK also made another NEW 52wk HIGH and it certainly is NOT that red. seen it 80-120 some days in the red & also in the green. had to get these out of the way. sorry for the multiple posts. Finally! USD capitulation. I think we have a hammer. Look for a series of upside gaps to confirm the deal. Things are going to get real interesting! ……………with the greatest of respect…..Herr Verne……….we must be looking at two different DXY charts …………..me no ………….see…………….no bottoming wick??? Thank you for posting the “link” to the close only line chart for the S&P. That is a powerful chart! For others…It is Peter G’s response to my request made on January 23rd at 1:01pm. 1)	Today was a swing high and low day like 7/27/17. Based on day-counting, it’s not yet April 20, 2016 but the fractal suggests that today is April 20th. For either scenario my hypothesis suggests a lower low in between the month-end window dressing/Potus’ State of the Union address high (lower high?). Luri… it’s a 911 day. Jan. 31 FB earnings after hours. Feb. 1 earnings AMZN, AAPL, GOOGL, MA. So 1/31 to 2/1 are important days. Not April 20 but April 19. Slightly getting in sync . Without digging further my gut is telling me it is failing . I’m staying bearish yet there is massive risk . I am long some 47 stocks , I use my bearish trades as a hedge. That not everything falls or rises together . GE is a good example and there is several examples . Cycle which ends in early April. We are coming up on a full Moon now as well at the end of the month . Yet life is worth living . So transferring data back to my laptop . Repeats almost exact each time . The set up is always the same . I need to see the visual to make any claim on direction . Jan 26- Feb 2 should be a high of sorts . I cannot rule out a new high or at least a ‘re test . If it’s a slight upward bias I’ll call it bullish despite my bearish bias . The big move though begins March 1 st . The market to 1957 , that analysis failed to come true . 1958 was an extremely bullish year which is why he is extremely bullish . Is not all that good . My opinion on newsletters is they need to be educational . If you can’t learn the process how can you go out on your own ? It’s great when it works but it doesn’t always work . On a monthly chart . The indicators are no where close to being oversold . Down trend . Like it or not that is what the wave count is telling us . This puts into question just how this great depression will unfold . Was in the year 2015 and that places us in wave C of an expanded flat . That said , it is being creative with the wave count and not just seeing what is right in front of us . That is Elliott principle 100 . It defines your risk and tells you when your wrong . The US dollar breaks above the Jan 2017 high I’ll accept it whole heartedly . Until then and after some 20 years of thought . I am now an official dollars bear . A move back to the 97 – 100 price level I’d consider as a wave 2 . In 2024 than it is today . 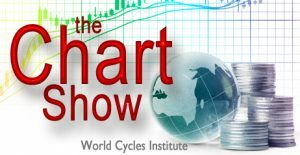 The debt cycle will destroy the dollar . I have changed my mind because the Elliott wave count . And a major bottom in gold . You can argue your bias but you can’t argue what the wave count has stated . Interesting info on the duration of dollar declines following the last 106 months of advance. We certainly have not had anywhere near six years of decline since as you noted, we only peaked in January of 2017. 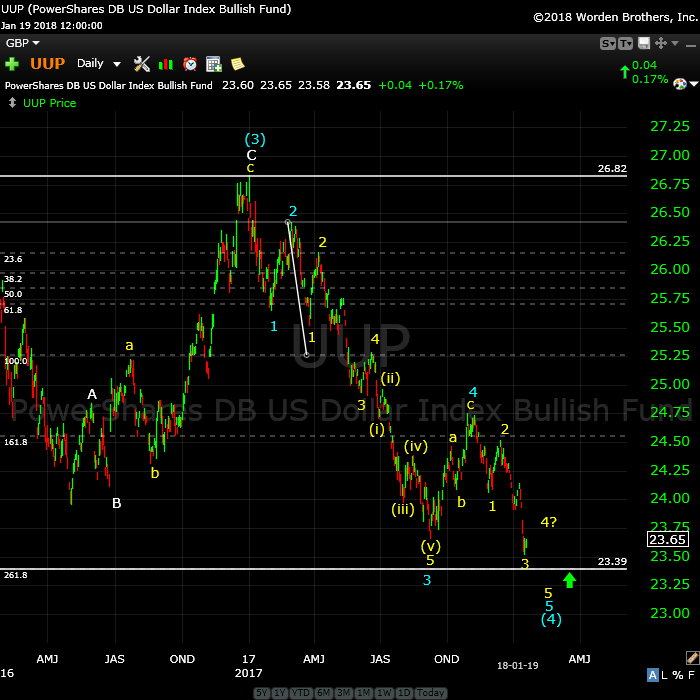 If I knew nothing about EW theory, the current macro-economic prospects for a deflationary cycle would lead me to expect an EW count that saw a higher dollar. My view on prospects for the dollar in a deflationary environment is exactly the opposite of yours Joe, and I think supported by past history. I think Peter T’s wave count that has us completing a fourth wave is correct as that count calls for the dollar to move on to a new high in a fifth wave. I agree with you on the dollar’s ultimate demise. That will not come, in my opinion,until the FED embark on a crusade to battle the coming deflationary cycle with massive money printing unlike anything the world has ever seen. I think being on the right or wrong side of this debate is going to make or destroy and incredible amount of wealth, so folk really need to do their homework on this score. I think what most folk are missing is that the vast majority of the world’s debt is dollar denominated. First deflation, then inflation. At least that is my understanding of what is just ahead. It is a fascinating discussion to be certain. I don’t post crash alerts unless I see something in the energy charts that catches my attention and tomorrow is going to be a very interesting day. I see 2 major lows, 1st @ approx. 11:00am and the Big Whopper low @ approx. 2:30 to 2:45 with a “V” shaped recovery into the close. Thanks Tom. I was also looking at the Sept. 6-8, 2016 fractal but I can’t figure out what would trigger a Sept. 9-like huge drop. Perhaps bad pre-market earnings & warning report from either CAT, celgene, biogen, fcx, raytheon, 3m & the other 2 airlines. Hi Tom ,do you have a chart for us? But seriously, that is exactly the kind of price action I would expect going forward, until and unless the sentiment of the herd changes sufficiently dramatically enough to cause the banksters to loose control. I read an interesting article today in which Dalio is making fun of folk (like moi) mostly in cash and talking about how they are going to continue feeling quite stupid. A more thoughtful (and humble) Schiller is pointing out that markets do not need a “trigger” to sell off precipitously. He pointed out that in the Summer of 2006 people were lining up to buy condos in Florida. One month later, the lines had completely disappeared, and not owing to any trigger anyone could point to. Sentiment simply had changed. The same could happen in this market environment. I think this a most salient point! Took a quick gander at futures and viola! Yet another triangle of some kind! This is nuts on steroids. This triangle was clearly entered in what looks like a similar degree downtrend so chances are quite high that the break will be to the downside. I agree with Tom about price direction tomorrow. About the “V” recovery, I guess we will just have to wait for Mr. Market. I will repeat it until I am blue in the face – a rout that does not begin in futures probably will not stick. I guess I am saying we will get a snap back of some kind unless futures action changes. Will somebody make up my mind? ha! ha! That was clearly, in hindsight, a triangle entered as part of the larger uptrend so probably a fourth wave of some kind. This would make the thrust out of it a likely fifth and terminal of the current wave up. If correct, I expect yet another higher VIX close. young man ……………….. you are ……….”sooooo”………….going over my knee right about now…….. in the days of old…………..discipline was called ………………”a whoppin”! https://invst.ly/6fwx0 – ES in da mornin! https://invst.ly/6fwyd – DXY – so it was a continuation candle……i need to see capitulation today – or else we could potentially go ALOT lower!!!! Wow! Looks like Tom’s call right on the money. Despite new futures high, it looks like we are setting up for an interesting opening. If we get a VIX gap up at the open that would be Yuge…. that afternoon drop should have been way deeper. They countered the fall by ramping up the US dollar vs Yen trade. They do this all the time. It’s called in your face manipulation by the insiders. If we take out 88.44 I will be doing some serious hedging of my long dollar trade.Looking forward to breathing a bit easier when we cross 90 to the upside…. Correction. That hammer low was actually 88.27, not 88.44…. New highs in futures ignored by the cash session is rare. Bearish! I added a whitelist plugin and added you to it. It seems to be working.